On Saturday, we had Catie’s birthday party. As I mentioned a while back, we had agreed to do a small party at our house, with just a few friends and her cousins. 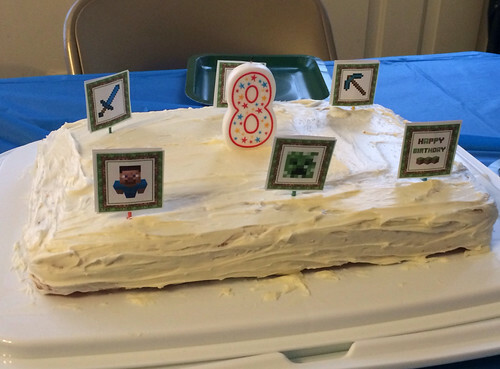 She wanted to have a Minecraft-themed party, but the problem is that Minecraft doesn’t really have much in the way of merchandise. Action figures, sure, but not party supplies. So, I hit up Pinterest and found some cool, free printable Minecraft stuff for her party. 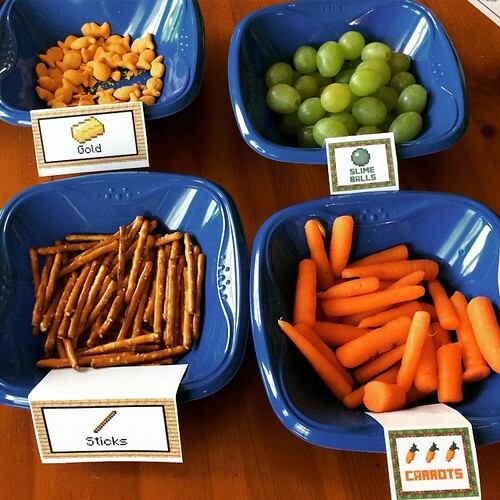 Print-your-own stickers for goody bags! 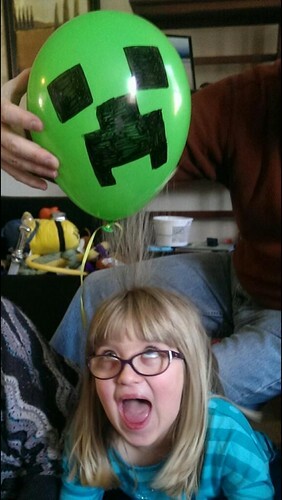 A stencil so you can make Creeper faces on balloons! That kind of thing. The kids had fun, and the great thing about their age range is that they mostly entertain themselves. Lucy was the youngest kid there by far, and I knew that the whole Minecraft thing isn’t her scene and she’d feel left out, so I turned on Frozen for her in the living room. She watched her movie and had her grandparents all to herself, while the rest of the kids hung out in the playroom, playing Minecraft or working on art projects or whatever. What’s weird is that I was so stressed about the party beforehand, but once it started, I was fine. All the kids had fun, and I didn’t really need to obsess about every last detail nearly as much as I did. So, yeah. It was pretty great. 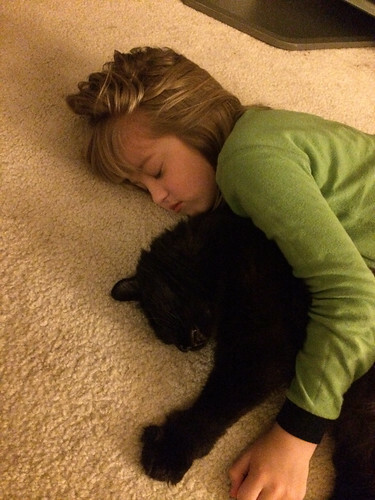 Random funny aside: my sister flew in for the weekend, which meant Catie got to spend some time with her favorite person on earth. On Saturday night, my sister and I were in the bathroom with the girls while they were in the tub together. Like, you can’t just TELL someone they don’t have ice powers! Maybe she does and you don’t know! Anyway, hooray for birthday parties! A good time was had by all, and the party successfully exhausted everyone. Even Beaumont. This entry was posted in Cate, Lucy by Cindy. Bookmark the permalink.